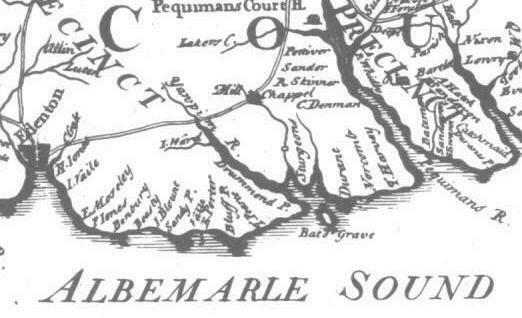 Albemarle Sound in the northeast corner of modern North Carolina was once, pretty much, the southern reach of Virginia. Rivers produced this result, specifically the Roanoke and Chowan Rivers. Both are difficult to cross and obstruct traffic moving south and west from the Chesapeake. But east of the Chowan there are two lovely passages for land traffic on the north-south axis, one east of and several west of the Dismal Swamp. The Dismal Swamp, itself, was essentially impenetrable for most travelers; it was a great place to hide out, but an awful place to pass through. Into this matrix of channels and barriers fled North Carolina's first permanent settlers, proto-Quakers from Virginia and Maryland. It can be argued that their flight through "Southside" Virginia, past the Dismal Swamp, and into the buffered lands of the Albemarle District profoundly altered the trajectory of both Carolina and American history. Sixty-five years before fugitive, Protestant sectarians fled into the Virginia's southern hinterlands, refugees from England's first attempt to colonize the southeast of North America probably fled northward into those same lands. Roanoke Island, the seat of Sir Walter Raleigh's colonial invasion of North America sits just below the mouth of Albemarle Sound. Raleigh's colonists regularly coasted along the sound in search of food to be begged, borrowed or stolen from the native residents of the shores. The natives of that region quickly tired of the filthy beggars from the island and reportedly, after sharing what they could, they turned a deaf ear to the English who, then, took by force what they could. Things quickly grew ugly and it is likely many of the early colonists, but not all, died at the hands of disgruntled neighbors. If Roanoke Island's Native American neighbors were at all like Native Americans elsewhere, in other times and places, they seldom killed indiscriminantly. It is, for that reason, likely that the folks who finally carved directions at the entrance of the English fort on Roanoke, dispersed into Native American villages north and south of the island. Which is to say some of the first English to permanently take up residence in North America did so on the north shore of Albemarle Sound. It is imaginable that when the first settlers came down from the north they were met by the blended children and grandchildren of Roanoke Island's original English occupants. It is a fact, though, that we have no surviving records indicating survivors or their kin were ever identified as such. Instead, we have some very interesting journals of reconnoitering parties poking around in southern and southwestern Virginia in the first sixty years of Virginia's colonial experience. They almost all report Native American intelligence relating the existence of Europeans living among the tribes southward. 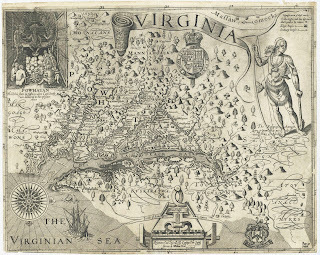 The English of Virginia, though, for their first forty or fifty years were preoccupied with surviving Indian wars, starving times, and sectarian butchery to give much thought to matters southward. Having slaughtered their king (1649), the English empowered Puritan protestants to govern in his stead. These sectarians then, in North America, set about slaughtering neighborhood heretics. One never knew from one week to the next who would be declared heretical; the 1650s was a time of great insecurity. It seems, though, that the one group all could agree were generally worthy of execution were the nascent sect that would eventually be called Quakers. Ruling elites in Virginia and Maryland in the middle of the 17th century were, respectively, Anglicans and Catholics, and when it came to Quakers they concurred that hanging would settle the heretics' hash, and they set out to exterminate the devil in their midst. The Society of Friends didn't really exist in 1650. On the theological fringes of Puritanism there were, though, some extremely democratic, extremely self-authenticating, extremely extremist groups that would one day coalesce as the Society of Friends. Called variously Seekers, Ranters, and Levellers by their friends, they were feared, disdained and detested by English elites and would-be elites alike. Generally rejecting all authority outside the self, during 1650s these extremists became easy targets for all would be authorities. Anglicans in Virginia and Catholics in Maryland, liberated to command by the death of their king, proceeded to purge these errant sects and, in response, the Seekers, etc, headed south, into the swamps and marshes, into Albemarle country. This apparently suited the elites as they didn't pursue the dissenters. 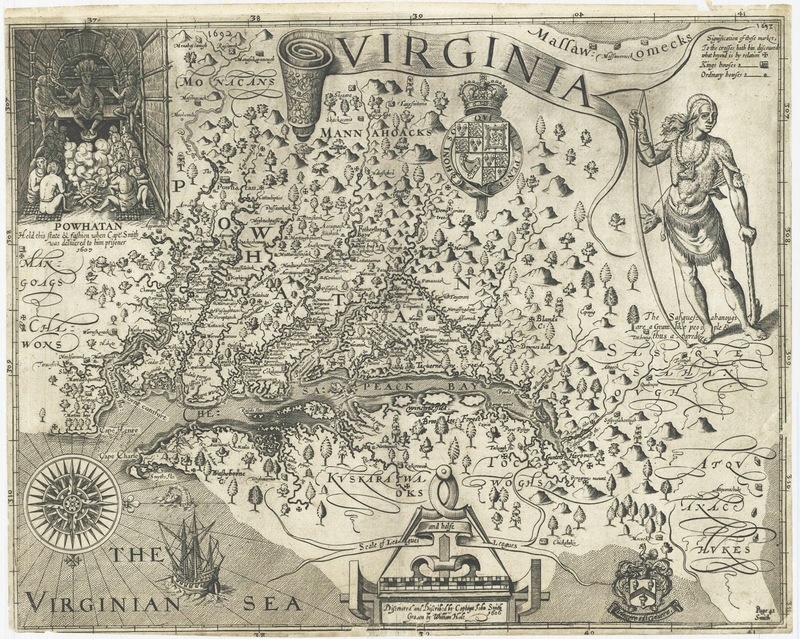 Geography and diplomacy ensured that the folk of the Albemarle region would be isolated from Virginia. South of the James River, navigable streams flowed south, away from the Chesapeake, and generally into the Chowan River drainage. The lands west of the Chowan's drainage were, by treaty (1646) reserved for Native Americans. Southside Virginia, owing to its geography became a buffer between Chesapeake society and the frontiers south and west. So, likely for this reason, shortly after the disaffected sectarians absconded southward, Virginia's Governor William Berkley, as high an Anglican as one could find, created a virtual colony within his colony, east of the Chowan and south of Chesapeake Bay, called it "Albemarle" and gave it a governor, William Drummond (d. 1677). The actual occupation of the Albemarle is less well documented. The first known transfer of lands from Natives to newcomers was the purchase of land (ca 1655-1660) on the west side of the mouth of the Paquatank River by Nathaniel Batts, a trader. George Durant stood witness to the transfer, so we know at least these two gentlemen were hanging around in the 1650s as the Albemarle filled up with proto-Quakers. It is likely that Batts was not a "fur trader" as has been claimed by some, but rather a general trader who ran a store where, absent an adequate supply of legal tender, he sold goods for payments in-kind. He undoubtedly took in trade anything with a discernible value, and equally undoubtedly he cut himself a decent margin in his trades. For pins and needles and lead and gun powder, he was likely to have taken in distilled liquor, herbs, dried fish, hides, feathers, and darn near anything tote-able and re-sellable. This was a normal and expected mode of frontier business. He, in turn, sold the traded goods at his store or abroad, in Virginia proper. Batts, like many frontier traders, lived a lonely existence, but in his case, perhaps his loneliness was more artfully contrived than necessary. After his initial land purchase he moved his operation onto an island near Drummond Point (named for William Drummond), off the mouth of the Yeopim River where he is said to have preferred the company of his Native American customers over that of his European neighbors, a not uncommon choice among those who had the choice. Yet, in Batt's case, his choice of location, if not friends, may have had more to do with business than the esthetics of society. Pirates and smugglers abounded on the Carolina sounds in the 17th century, and it would make perfect sense for a leading trader to position his business as he did. The freebooters of the sounds were the source of most trade goods and specie in at that time, and Batts may well have positioned his business to take advantage of that trade too. As the island was only a hop, skip, and jump from the seat of Albemarle's governor and nearby that of its attorney general, it is likely those two officials willingly turned a blind eye toward Batts' safe haven, it providing a valuable public service and all. Batts died and was buried there (1679) and later generations called the island "Batt's Grave". The island disappeared forever in a 1950s hurricane. Nathaniel Batts, William Drummond and George Durant live on in North Carolina history books and in Powell's North Carolina Gazetteer which lists extinguished places alongside existing places. It is a pity we know so little about the intertwined lives of these three, respectively North Carolina's first recorded trader, first Governor, and first Attorney General. It bears noting that literate and official folks, generally, do not lead the charge into strange and potentially hostile lands. We know of these men because they left behind a paper trail. Odds are they were followers, but those who led the way into the Albemarle, bless their hearts, are lost to history. In the next installment we will consider the how it was that four of North Carolina's first governors were put in office by armed and marvelously cranky Albemarle Quakers who may well have helped Nathaniel Batts decide where to live and who to hang out with.